Stocks have completely recovered from their flash bear market of late 2018. Can already record high prices continue to rise in the face of falling corporate profits? Stocks are priced for perfection, and falling earnings per share is the definition of imperfect for the stock market. But now they face a hard question: Can already record high prices continue to rise in the face of falling corporate profits? A business generates improving profits when the things it sells rise in price faster than the cost of production. So, on the following chart, you want labor costs to be flat or falling, and the other line - a measure of inflation - to be rising. But lately, the opposite is true. 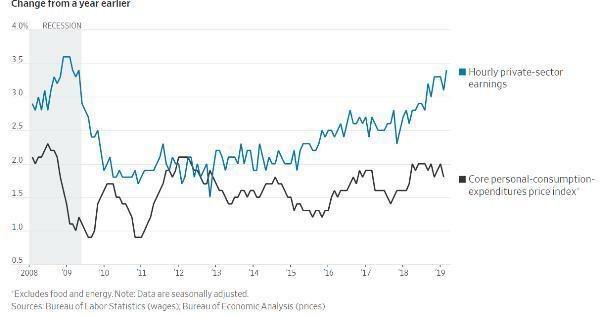 A big part of the past decade's spike in corporate profits came at the expense of workers, who saw real wages stagnate while the cost of living rose. Now, with labor markets tightening and minimum wages rising, workers are getting a bigger slice of their employers' revenues. That means shrinking corporate margins and, other things being equal, slower-to-negative earnings growth. 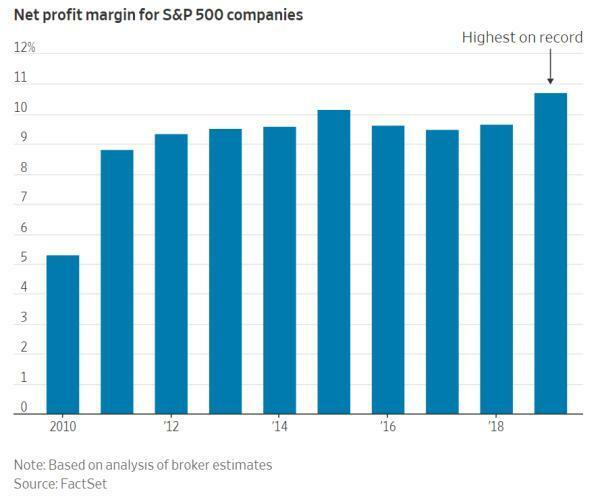 Now let's look directly at corporate profit margins. Note that they stopped widening in 2015 as wage inflation began to bite. Then, they spiked in 2018 when the Trump corporate tax cuts provided a one-time windfall. But that windfall is over, and future comparisons will be with last year's unbeatable earnings. As a result, public companies are going to report lower year-over-year profits going forward. Why does that imply falling stock prices, especially when corporate profits stagnated between 2015 and 2018 while share prices kept rising? Because of what those rising share prices did to valuations. 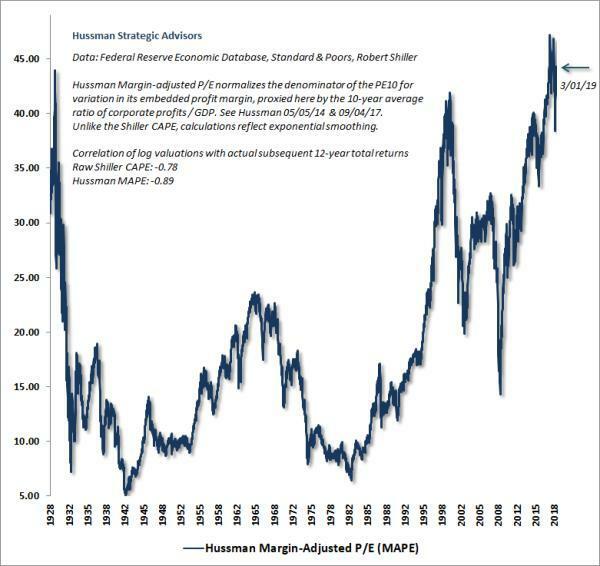 Stocks are now a lot more expensive, both nominally and compared to earnings than they were in 2015, which means the air pockets under them are much bigger. They're priced for perfection, and falling earnings per share is the definition of imperfect for the stock market. Based on history, the next few years look brutal for the US stock market. Which raises yet another question: Is history still worth anything in a world of out-of-control central banks and hyper-profligate governments?